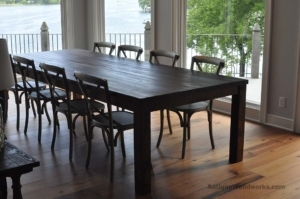 Here’s a wonderful white oak farm table we recently completed for a customer. It has a wonderful, authentic texture and color. There’s no staining — this is the natural color after a penetrating oil finish. The thrill of this table was that the original tenons and nearly 150 year old scribe marks were preserved in this table. 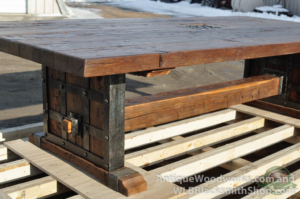 The table started out as a the studs from a humble old granary on the prairie. The studs were all mortised into the sill plate and rafter plate. This is nothing like the quick toe-nail shot with a pneumatic nailer that they do today. We used carriage bolts that run entirely through the top and the leg support. The heads have been individually hand hammared by our blacksmith, Wyatt. Creates a very strong connection but allows the top to be removed from the base.